We got to Westbury early, 9am! By 9:30 there were about 6 RW's and 2 Flexis on the hill. Sky looked good to the east but still blue with occ. wispy. By 11:30 the Cu's started proper in the west so took off (after Sean went down on a GB!) with the wind 45 deg off. Appalling takeoff, others had similar. Quite scratchy low down, but hooked scrabbly lift to 6-700ft to ensure I safe. Moved sideways under cloud and went to 4k, flew upwind to get turnpoint (start of 84m O/R) then flew back to join Geoff and cored 'down' past him! In the wrong place so glided out to Westbury town with little height but under perfect cloud - bang, up to base where I met up with Geoff. Flew south, leaving hill just after 12pm, usual glide/climb, etc, but keeping east away from flat area to SW (Yeovil, etc) which has a bad reputation with sailplane pilots. Took in --- sites (Monksdown, then Bell), where shortly I met up with Geoff again and we flew to the coast together. I was 1.5m from my turnpoint but it was now 1:30 and the air to the TP was 8 down so I mark/entered and pointed back north, thinking Geoff would do the same. 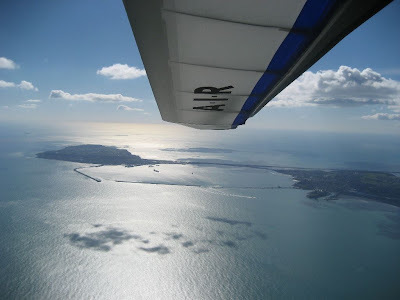 Geoff went for the TP and flew around the coast and off to Portland Island - the view was staggering (here is Geoff's piccy). Geoff landed at Portland just after 2pm. I really didnt think I could get back upwind (10Mph?) this early in the season but kept plodding and bit by bit it worked. The VR is staggering! I had 2 low spots (1500ft) but eventually got back to the 5500 base which went to 6000ft near Shaftesbury. Carried on up to A303 (18 miles from TO) and it was 3:30 and getting weaker. There was a few Cu to the East that may have worked, but tactically I had to follow my outbound GPS trace to ensure I could still claim an undeclared O/R if I landed short, which I did (about 8 miles). Obviously very happy with flight, still being amazed by this glider, the sink rate is outstanding. Tony Moore picked me up, arriving before I'd even derigged (the beauty of closed circuits). Geoff & I entered our flights and I see Malvern club is now winning NXCL. The start of many hopefully.